Vancouver is an amazing place to call home. It is a beautiful, desirable, safe city with a high quality of life–and the local rental market reflects these factors. Be prepared that rent can be high relative to many other cities, and that the rental market is competitive. But don’t worry! You are not alone, and help is at hand. Email our Housing Advisors at housing@blanchemacdonald.com and ask to join Housing Help, our private Facebook group, where you will find a selection of housing ads and posts from other students looking for roommates or shared accommodation. Our part-time Housing Advisors can provide resources to support you in your search for accommodation. Although they are happy to help however they can, it is the responsibility of the student to find and secure their own housing. we are happy to give you insight on the rental situation in Vancouver, good neighbourhoods which offer easy transit, budget options etc. Finding housing is such an important and personal endeavour. It is part of your college experience to take on this responsibility and to do the research and investigation to find the housing or roommates that best suit your needs. If you are having trouble in your housing search, or have specific questions about housing, contact our Housing Advisors at housing@blanchemacdonald.com. Here are some useful tips and resources to assist you in finding and securing housing. The resource information provided is for your general information and is subject to change without notice. Any companies listed are provided as resource support. We are not endorsing any of these third party organizations. It is your responsibility to do the research to ensure that any rental company, homestay organization or housing resource meets your satisfaction and needs. The first step to finding accommodation is to identify the best housing type and location according to your allocated budget. Top Tip: Don’t start the search too early–and don’t panic if you don’t have housing in the month before your start date, as this is often the best time to find rentals. But do start researching ahead of time to understand the market. Many students attempt to start their housing search far too early. For instance, if you want to start your rental on September 1st, it will be very difficult to find housing in February or March. Since most rental agreements only require a month’s notice, many long-term rentals only go on the market a month or a few weeks before the move-in date (usually the 1st day of the next month, though sometimes it is the 15th of the same or the next month). So, if you are searching for a rental with a move-in date of September 1st, that apartment or room will often only be advertised around or after August 1st. Therefore, the best time to start searching for that September 1st rental is the end of July and first weeks of August. But it’s never too early to start researching! It's always a good idea to start looking at ads early so that you can gain an understanding of what's out there, how ads look, how the market is working, what the general going rate of their ideal accommodations are, neighbourhood costs, etc. This will help you become more informed, budget appropriately, and be realistic about expectations. If you need a short-term rental (see above) when you first arrive in Vancouver, these can usually be booked several months in advance, but tend to come with a higher price-tag than long-term rentals. Long-term Rentals are usually the best option financially. They often require a commitment of at least six months to one year. Once a one-year lease is complete, your lease may go to month-to-month, but often landlords do prefer or even require you to sign another year-long lease. If, at the end of the lease term, you wish to change to a month-by-month rental, don’t be afraid to negotiate with your landlord. At that point you will have already built a relationship/rapport with your landlord and have proven your commitment to the property and lease, so they may be more than willing to compromise. Another option to investigate is searching for a room in a shared home. This can be with fellow Blanche Macdonald students that you connect with through the Housing Help Facebook page, or an already-established home looking for a roommate, which you can also find through the above sites. Short-term rentals can vary from daily to weekly or monthly. They don’t necessarily require a specific time commitment, but can be more expensive than long-term rentals. If you are moving to Vancouver from out of town, it is often useful to book a short-term rental for a few weeks or months while you settle in, open any necessary accounts, collect references, and conduct your accommodation search. That way you can be in town to check out neighbourhoods, meet face-to-face with prospective landlords, sign leases, etc, while having a temporary home base to work from. Furnished suites are a convenient option for shorter stays, and many include some services, such as cleaning and utilities. Make sure you confirm what services and supplies are included before you make your decision. GEC - Global Education City Student Residences are student-geared residences across Metro Vancouver offering furnished private and shared apartments and suites which can be rented for a week, month or longer. Each apartment has a shared living area, kitchen, bathroom, in-suite laundry and WiFi, and some locations have fitness centres. YWCA is a non-profit organization offering private and shared furnished rooms in downtown Vancouver. AirBnB (airbnb.com) and HomeAway both offer a wide range of rooms and apartments, often used as holiday homes or short-term rentals for students and professionals. Vanmates Homestay and Rooms offer a mix of Homestay options and private rooms in shared accommodation. Liv Rent is a rental portal and app that allows you to search for properties, find out information and book viewings for short-term and longer term rentals throughout Metro Vancouver. Homestays are a great option for students looking for a family environment, and are particularly recommended for International Students who want to immerse themselves in Canadian culture and improve their English language skills. Homestays place you in a home with a Canadian family who provide you with a room and, in many cases, meals. Many students choose the Homestay option because of the extra safety factor, since they are pre-screened by an agency, given a criminal record check, have home inspections, and offer secure transactions. Some also offer an airport pick-up. One of the best ways to find accommodation is to take a walk around your desired neighbourhood(s) and look for vacancy signs. Because of the competitive rental market, many landlords (especially those who aren’t tech-savvy) prefer to post a Vacancy Sign outside of their home or building. Walking around is sometimes the best–and only–way to find rentals that would otherwise be snapped up online! Be the first to know and enquire about these spots. It’s a great way to get a feel for neighbourhoods too. Bring your phone and references, and be ready to give a great first impression. Is the location in walking distance to transit? Will you need to take more than one mode of transportation? How frequent is the bus, train or other mode of transportation? Is it worth it to you to pay cheaper rent if it means having a longer commute? Is your chosen neighbourhood safe? Are there noise or safety issues? Do you mind biking or walking to school or to shops/restaurants during poor weather, or is it worth the extra expense to live more centrally? Remember, Vancouver is often rainy outside of summer months, and can get cold in the winter months. Do you prefer cooking or dining out? Do you have access to a kitchen and cooking supplies, and/or have easy access restaurants and grocery stores? To find out more about Vancouver’s transit system and costs visit the Translink Website at https://www.translink.ca/. Prices in these areas vary greatly, even within individual neighbourhoods, according to location, distance to transit and shops, and the condition of the accommodation. To give you a rough idea, we have estimated price points for each neighbourhood. 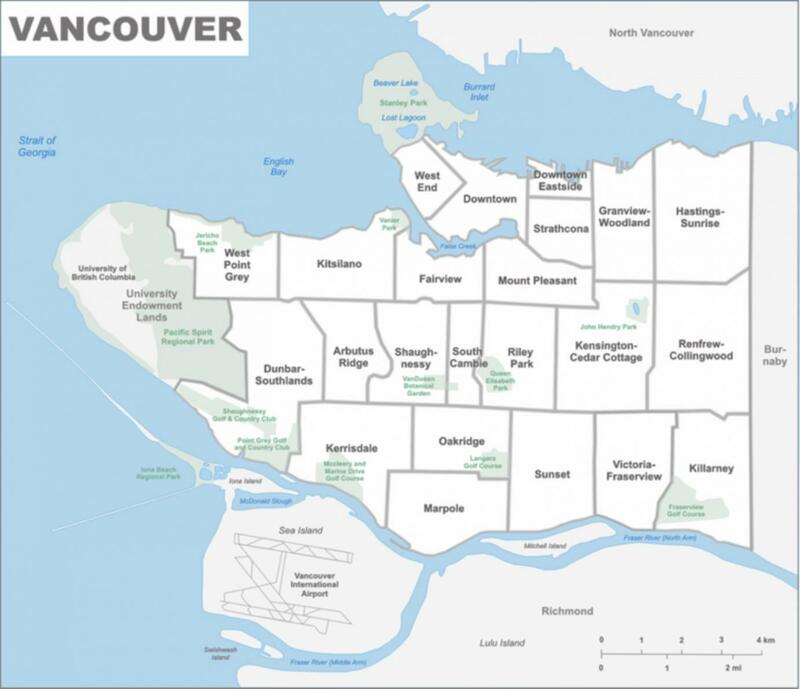 Below are some of the most popular and convenient neighbourhoods in Vancouver for our students. Character: Vibrant, bustling and busy, downtown Vancouver is the cultural and financial hub of the city, with great shopping and dining options, and busy nightlife. On the Northeast side of downtown is historic Gastown, home to high end restaurants and shops, and Chinatown, the historic home of the Chinese community, while to the northwest is Coal Harbour, an upscale neighbourhood on the water. Distance to Campuses: A great option for students at the Atelier and Robson campuses, which can be reached by walking, cycling or a short bus or train ride from all areas of downtown Vancouver. The City Square Campus can be easily reached by several bus routes and the Canada Line (approx 15-25 mins). Suitability: If you like a busier, livelier urban neighbourhood comprised mostly of apartments and high rises, this is a great option, but bear in mind it can be expensive! Character: The diverse and dynamic West End is home to a wide array of restaurants, convenient grocery and specialty stores, and is the proud home of much of Vancouver’s LGBTQ Community. English Bay Beach and Stanley Park are easily accessible. Distance to Campuses: Atelier and Robson are within walking or cycling distance, or a short bus ride; City Square is accessible by bus, train or bike (approx 30 mins). Suitability: If you are looking for a diverse and vibrant neighbourhood with all the conveniences and easy access to nature, this is a great neighbourhood for you. Residences are mostly in apartment blocks (some heritage), with some houses. Character: An upscale downtown neighbourhood, with lots of high end restaurants and bars and a vibrant nightlife, and easy access to the seawall and waterfront parks. Distance to Campuses: A short walk or cycle to the Robson and Atelier campuses, and a short bus or Canada Line ride to the City Square campus (approx 15-25 mins). Suitability: Great for those who would like to live in a bustling, vibrant neighbourhood close to the water, although note that this is one of the most expensive neighbourhoods in Vancouver. Residences are mostly apartment blocks and high rises. Character: A mix of families, diverse communities and businesses, Fairview is central and convenient with great dining and shopping options. The neighbourhood extends on either side of Broadway, one of the main thoroughfares of Vancouver, between Kitsilano to the west and Mount Pleasant to the east. Distance to Campuses: City Square, located in the Fairview neighbourhood, is easily reached by walking or cycling, while our Robson and Atelier campuses are a short bus, train ride or cycle (approx 15-25 mins) away. Suitability: If you are looking for a busy neighbourhood with lots of convenience, good transit connections and plenty of shopping and dining options, Fairview is an excellent choice, particularly for City Square Students. Residences are a mix of modern and traditional apartments and houses. Character: A leafy residential area with a real neighbourhood feel, this area features tree-lined streets with houses and low-rise apartment blocks, and a cluster of independent shops, restaurants, coffeehouses and a cinema. Distance to Campuses: A great choice for City Square students, since Cambie Village is within a 10-minute walk. Robson and Atelier campuses are a short skytrain or bus ride (approx 15-20 mins) away. Suitability: Well placed for City Square students, this area is perfect for students seeking a quiet spot with a neighbourhood feel that is conveniently located. Character: A contemporary neighbourhood that was revitalized for the 2010 Winter Olympics, this area was used as the athletes’ village, and is now a busy and vibrant area on False Creek with plenty of amenities and dining options. Suitability: If you are looking for a modern neighbourhood on the water that is centrally located and close to all conveniences, this is a great option. Homes are mostly in contemporary apartment buildings and tend to be on the expensive side. Character: A diverse neighbourhood with good travel connections, located near Oakridge Shopping Centre, an upscale mall, and easy access to the Oakridge Canada Line station. Distance to Campuses: A short train ride or bus ride to City Square (approx 10-20 mins) or downtown (approx 20-30 mins). Suitability: For those seeking a quieter, more residential family neighbourhood with a mix of apartments and suites in houses, close to all the conveniences and located on the Canada Line to both campuses, this is a good option. Character: An upscale neighbourhood with great shopping along South Granville, good bus connections, a nice community feel and quiet, leafy sidestreets. Distance to Campuses: City Square is a moderate walk (approx 25 mins) or short bus ride (approx 15-20 mins) away, while the Robson and Atelier campuses are within a short bus ride (approx 20 mins). Suitability: Great for those seeking a quiet, affluent yet convenient neighbourhood. Homes are located in mostly low-rise apartments, with some houses and heritage buildings. Character: A leafy, trendy neighbourhood with great shopping along 4th Avenue, easy access to Kits Beach and the seawall, and lots of dining options, as well as the convenience of Broadway. Kitsilano was once Vancouver’s hippie neighbourhood, and is now famous as the birthplace of Lululemon. West Point Grey is an affluent area on the west side, and popular with families. Distance to Campuses: All campuses are easily accessible by bus (20-40 mins). Suitability: If you are looking for a pretty, peaceful area with a neighbourhood feel, lots of conveniences, and easy access to the beach, this is a great option. Homes are a mix of houses and apartments. Character: Leafy, quiet, affluent residential neighbourhoods on Vancouver’s west side, these areas are very popular with families and older populations. Distance to Campuses: Expect a 30-45 minute bus ride to any of the Blanche Macdonald campuses. Unfortunately these areas are not directly accessible by skytrain. Suitability: Great for those seeking a clean, quiet residential neighbourhood. Residences are mostly in family homes with basement suites, private rooms or laneway houses, and condos. Many are near conveniences such as shops, restaurants and cafes that tend to close early. Character: These are residential neighbourhoods on Vancouver’s southern border. Marpole is a diverse, leafy, quiet area very popular with families. Marine Gateway is a newly developed neighbourhood of high-rise apartments located on the Canada Line. Distance to Campuses: Expect a 30-45 minute bus ride from Marpole. If the accommodation is located near Marine Gateway station, expect a 10-minute ride to the City Square campus and 15-minute ride to the Robson and Atelier campuses. Suitability: Great for those seeking a quiet neighbourhood close to all conveniences. Homes in Marpole are in mostly in family houses with basement suites, private rooms or laneway houses, while the Marine Gateway neighbourhood has a mix of low- and high-rise apartments, townhouses and suites in homes. Character: Trendy, youthful and vibrant neighbourhood centred around Main Street, recognized as one of Canada’s coolest streets, with independent shops, great restaurants and cafes. Popular with students, young people and young families. Distance to Campuses: A moderate walk (10-30 mins) or short bus ride to City Square, and an easy bus or train ride (15-25 minutes) to our Robson and Atelier campuses. Suitability: Great for those seeking a real neighbourhood feel in a hip area that is close to all conveniences. Homes are in mostly low-rise apartments, townhouses and suites in homes (some heritage). Character: Vibrant, lively neighbourhood with a diverse community of young people and families. Commercial Drive was once “Little Italy” and is now also home to many other cultural communities. Distance to Campuses: All three campuses can be reached in about 20-40 minutes by skytrain and/or buses including the 99 B-Line. Suitability: Great for those seeking a vibrant neighbourhood with all the conveniences, though note the area right around Commercial-Broadway station can be a little edgy. Character: Vibrant, up-and-coming neighbourhood centred around East Hastings, with independent shops, restaurants and cafes. Distance to Campuses: Easily accessible to the Robson and Atelier Campuses - expect a 20-30 minute bus ride, and slightly longer to the City Square Campus. Suitability: Great for those seeking a slightly edgier, up-and-coming neighbourhood feel close to all conveniences. Homes are in mostly low-rise apartments, townhouses and suites in homes. Note that the stretch of Hastings between Cambie Street and Commercial Drive is part of the Downtown Eastside / Strathcona area and is not recommended for students. Character: A diverse mix of families and young people, with many shops, restaurants and cafes located along the up-and-coming Fraser Street. Distance to Campuses: Expect a 30-45 minute bus journey to all three of our campuses. By Skytrain the Robson and Atelier campuses are about a 20-minute ride from Nanaimo Station, located at the eastern border of this neighbourhood. Suitability: Excellent for those seeking a lower-budget neighbourhood that has a mix of trendy areas and more family-oriented, residential areas, as well as most conveniences. Character: Located on the south-eastern end of Vancouver, these quiet, residential neighbourhoods feature a diverse community of families. Distance to Campuses: Expect a 30-45 minute bus journey to all three campuses. Suitability: Excellent for those who enjoy a quiet residential area, and those on a lower budget. Character: Located on the eastern side of Vancouver, bordering Burnaby, these residential areas feature a mix of diverse communities, shops and restaurants. Accommodations are located in family homes and low-rise and high-rise condos. Distance to Campuses: The area is well serviced by buses and four skytrain stations with easy access to central Vancouver. Expect a 30-45 minute journey to any of our three campuses. Suitability: A great option for those with a lower budget but still want to be on a skytrain route. NOTE: The Downtown Eastside area and certain parts of Strathcona are developing and emerging neighbourhoods. While rents may be lower here, the area around East Hastings and Main Street is not recommended for students. 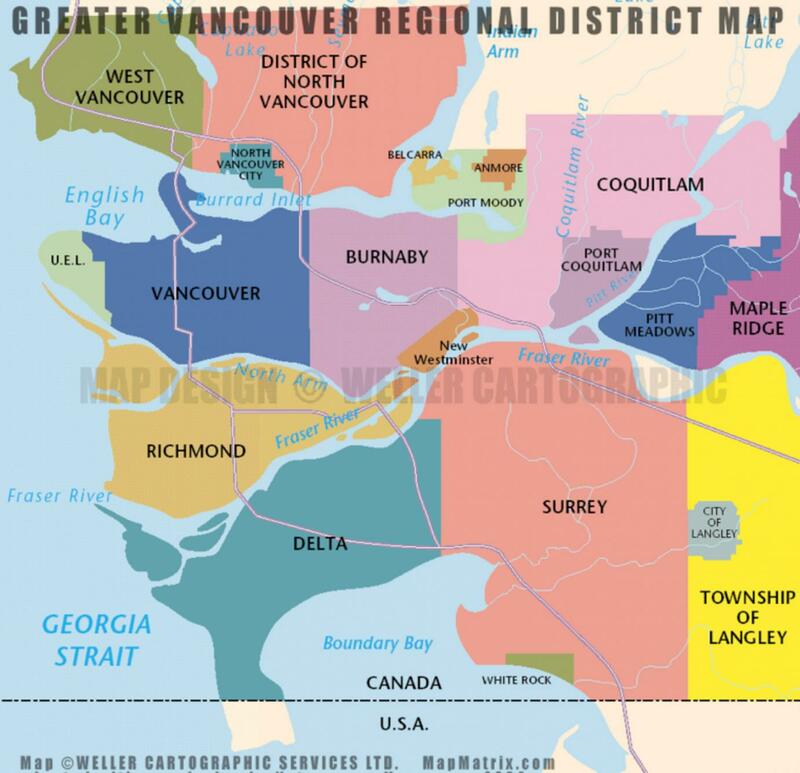 Vancouver is surrounded by several affordable municipalities, also known as suburbs. Depending on the municipality, the commute can take up to an hour or longer. Many local students live with their families while studying at Blanche Macdonald and commute from the suburbs. Below are some of the closer municipalities to Blanche Macdonald Campuses. We want your rental experience to go as smoothly as possible. Here are some factors to consider and recommended steps and tips for searching, applying, and securing your housing. Do all of the doors lock properly? Are the appliances in working order? Check the fridge, stove and any other appliances. Is traffic noise an issue? Do the shower and taps work, and is there hot water? Turn them on the make sure. Is the space clean? If not, ask the landlord to have it cleaned before you move in. Are there any signs of damage, such as water stains or signs of pests, that you should be worried about? What does the rent include? Clarify if you will have to pay extra for heat, electricity, cable, laundry facilities, storage, or parking. Apartment rentals are regulated through the BC Residential Tenancy Office. Know your rights and responsibilities as a renter in Vancouver. Will you be paying extra for utilities (electricity, heat, hot water, internet, cable)? Laundry: How will you wash your clothes and how often? Most apartment buildings have communal laundry areas with coin, token or card-operated machines. If you do not have access to a washer/dryer, where is the nearest laundromat? How is the internet quality? Is the apartment furnished or unfurnished? Furnished apartments often make sense for students who will be in the city for a shorter time. A scammer poses as a landlord and says they are out of the country and require a deposit on the rental. Once the money is paid, usually through a money transfer, the new tenant discovers there isn’t actually a rental. A scammer has somehow obtained access to a property or place. They pose as a landlord / property manager and show the victim the property. They then request an immediate down payment to secure the property and inform the victim they can move in at a later date. On the move-in date, the victim arrives only to discover it wasn’t actually a rental and there have been other victims as well. Check rental rates in the same area. Often fraudsters will try to entice their victims with low prices to elicit multiple victims. Are they just communicating with you via email? Fraudsters will not want to meet their victims in person to avoid being recognized and investigated by police. Are they asking for cash only or a cash security deposit? Cash is untraceable and can be used immediately. Are they asking for money to be wired? Once money is wired, it is extremely difficult to cancel the transaction. Also, money transfers are difficult to trace. Have you seen the place and walked around with the property manager or owner? Never rent a place that you have not been inside and walked around. Are they asking for personal information such as a SIN, bank account, credit card numbers? That information is not required to rent a place. Are they the landowner or property manager? Only the landowner and property manager have the authority to rent out a place (there are exceptions to this rule however, it is rare). Ask the neighbours about the landowner and history of the property. Neighbours are a great source of information regarding the owner and property. They can often confirm who the owner or property manager is. Top Tip: Approach a Housing Application with the same seriousness and professionalism you would approach a job interview. I am responding to your ad on Craigslist for a one-bedroom apartment. I would love to arrange a time to view the apartment. It is in my favourite neighbourhood and looks perfect! Please contact me at (phone number) or (email address) at your earliest convenience. Thank you for your time, and I look forward to hearing from you. If your enquiry is made by phone, the same rules apply - be polite, be professional, be respectful and be yourself! First impressions are important! Try to show up to any housing interview or search well-presented, and consider wearing what you would wear to a job interview. Think “business casual” rather than “straight from the gym”. Be early–or at least on time! Aim to arrive at an appointment between five and fifteen minutes early. Be prepared–have references at the ready, and any other paperwork that might be useful. Ask questions–show your interest in the property! Engage! Try and make a personal connection with the landlord and stand out from the crowd. This is important when the landlord is meeting lots of prospective tenants. Engage in small talk and get to know them on a personal level! If you find yourself in an open house situation where there are multiple potential tenants viewing the space at the same time as you, try and be 'the first to arrive and the last to leave', meaning to get there early if not on time, and be sure to stick around to the bitter end to show that you're interested and serious. You’ll also have more opportunity to speak to the landlord, engage with them and make an impression. If there is any pre-existing damage or required repairs, be sure to take photos before you move in. If your landlord says that something will be repaired or cleaned before you move in, make sure that this is documented in the Agreement. Ensure that both you and your Landlord have a copy of all the Agreements you have signed. If you change anything in the Agreement, both you and your landlord should initial beside any changes. Who will be paying for the utilities such as hot water, cable, heat and internet? Are cable TV and Internet included in the rent? Do you need to pay a damage deposit? If yes, how much? Can you share the apartment with another person? Who will make repairs in the unit? What access do you have to the laundry facilities? Will you be sharing cooking facilities or other common areas? When paying your security deposit, ensure that you have proof of payment. Pay by cheque or other traceable method of payment, or get a receipt if you pay in cash. It is highly recommended that you have tenant insurance. This will insure you against theft, fire, and other damage. This can be done through BCAA or another private insurance company. For a complete guide on renting in Vancouver you can take the free, online video course Renting It Right, offered by TRAC (Tenancy Resources and Advisory Centre) at http://tenants.bc.ca/renting-it-right/. IMPORTANT DISCLAIMER: The information provided is for general information and is subject to change without notice. Every effort has been made to provide accurate and complete information however Pacifique Riche Enterprises Ltd. (doing business as Blanche Macdonald Centre (BMC)) makes no warranty or representation as to the accuracy of the information provided. Some of the information provided may have been provided by independent third parties and should not be assumed to be approved or endorsed by BMC. BMC expressly disclaims all and any liability to anyone who acts in reliance on the information provided, whether the direct recipient of such information or not. Before acting in reliance on any information provided, you are strongly advised to contact BMC or such other person, organization or legal entity as you consider necessary or advisable to confirm that any information you are relying upon is current and accurate. BMC will not be responsible for any loss or damage arising to you as a result of any actions taken by you in reliance on the information contained herein or for any errors or omissions.